Mornings while on holidays are for sleeping in and the indulging in breakfast in bed! #treatyourself isn’t just a hashtag, it’s a necessity! 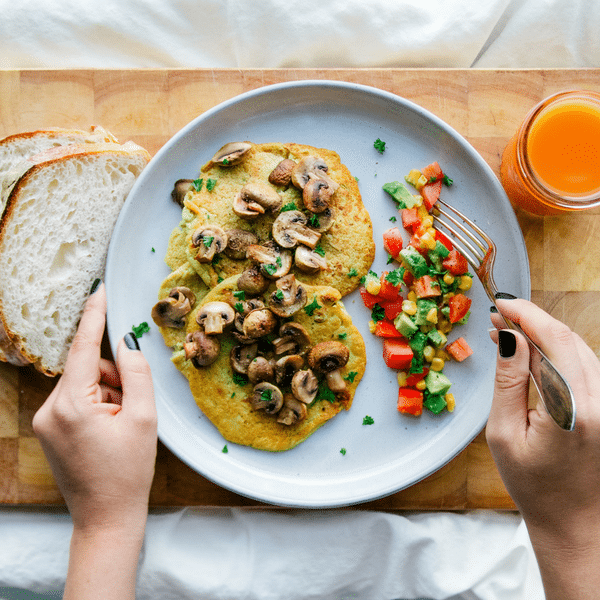 As such, we thought it fitting to team up with the amazing Marisa from Miss Marzipan to bring you this yummy, plant-based omelette recipe to make for your next breakfast-in-bed pamper session. Enjoy! Mix all batter ingredients and combine until smooth. The consistency should be pour-able, so add a dash more plant milk if needed. Leaving batter to the side, prepare the salsa by combining all the salsa ingredients in a medium-sized mixing bowl. Set salsa to the side. Add a little oil of choice (olive or coconut work well) to a frying pan over medium heat. Ladle batter into pan to create a small omelette of pikelet proportions. Keeping the omelettes smaller (but making several) is the most effective way to reduce breakages when flipping. Cook for around 2 minutes or until the batter firms and the side-down surface starts to turn golden brown. Flip carefully using a spatula and cook on the reverse side similarly until the surface is golden brown. Serve 3 or 4 on a plate, with salsa on the side. Top with sautéed garlic mushrooms if desired and extra additions. Serve immediately and season with sea salt and pepper to taste. And voila, breakfast in bed is served! Followed by snuggles with our heavenly soft 100% Bamboo Bedding! Don’t forget to join our mailing list to receive a further 10% OFF store wide including already marked down stock! Score up to 60% OFF selected ranges!